The music began, and I felt myself smile. Not because the music was an old, familiar tune. Just because it was rollicking, joyful sounding music. 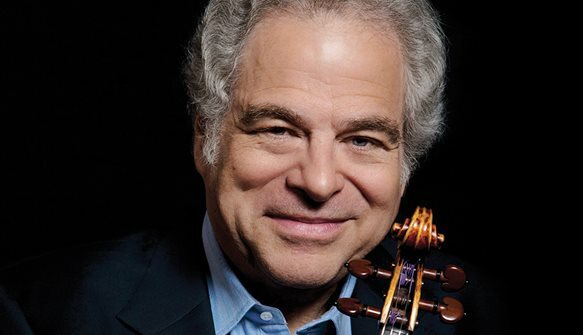 Those of us lucky enough to be at Davies Symphony Hall, Monday night, January 14, were treated to a full concert of Klezmer music led by the great violinist, conductor, fiddler Itzhak Perlman. He shared the stage with a crowd of gifted musicians playing accordion, bass, bass clarinet, clarinet, tsimbl(cymbalom), drums, guitar, mandolin, piano, saxophone, tambourine, trombone, trumpet, violin, and singing. I think there was a total of 15 musicians, but since most of them played more than one instrument it became hard to keep track. This music is “something completely different.” In his typical fashion, Mr. Perlman was modest and also brilliant. When the musicians came on stage, I did not see him. Then, I realized he was there but allowed himself to be camouflaged by his colleagues. Pianist Hankus Netsky acted as MC, offering bits of history and musical introductions. He and Mr. Perlman established an occasionally competitive conversation with Mr. Perlman urging Mr. Netsky to get on with it instead of talking and adding his own commentary. It was a playful Pat and Mike act that was informative without being weighty. Mr. Netsky is Founder/Director of the Klezmer Conservatory Band, and was music director and arranger for Eternal Echoes, Itzhak Perlman’s collaboration with cantorial, Hassidic, and Yiddish music, available on Sony Masterworks. The name Klezmer comes from combining the words for “tool” and “to make music,” translated as “vessels of song” or “musical instruments.” It also referred to the musicians themselves, not always in a positive way. In the 16th – 18th centuries, “Klezmer” replaced an earlier word for them, “leyts” which means clowns. Mr. Perlman injected this information as his partner described them as scholars. In the early 20th century, recordings referred to it as Yiddish music. It was also called “Freilech” music, “Happy Music” and my recent 21st century reaction attests this is apt. The music has an Eastern sound to it and also a distinctly Romani (Gypsy) sound. The Hedgehog musician says it has a different mode, plays in different scales. It is expressive as well as lively; one can hear sounds like a human voice laughing or sobbing, The oldest written record of Klezmer is from the 15th century, but that music would not be what we can hear now. The strongest 19th century influence came from Romania. The Klezmer like the Romani musicians, Lautari, were traveling musicians and they played music together. The Rabbis did not approve of the Klezmer because of their on the road lifestyle, but they were needed for weddings. The Bible mentions orchestras of musicians and Levites playing music. After the destruction of the Second Temple, some Rabbis disapproved of making music, but back then also it was necessary for wedding celebrations. In Ukraine, the Ukrainian authorities would not allow them to play loud music, so they began to play string instruments and cymbalom. When more Jewish Eastern Europeans arrived in the US, 1880s – 1924, they heard American jazz. Elements of jazz can show up in Klezmer and, like the connection to the Romani music, an exchange occurred. The concert at Davies Hall was a feast of wild rhythms, fantastic interplays of vocal and instrumental music, speed demon virtuoso performances. Mr. Perlman performed with Andy Statman, a blue grass and Klezmer star; they blew away any observers’ desire to find a bunch of words to describe what they were hearing. When Klezmer’s popularity faded, other composers found treasures in it: Mahler and Shostakovich, jazz and swing leaders Benny Goodman, Artie Shaw, Ziggy Elman; Gershwin, Bernstein, and Copland. There have been several significant Klezmer revivals: in the 1970s; a new wave in the 1980s with non-Jewish musicians; in the SF Bay Area in the 1990s. The January 14 program featured tunes that might be played for a riotous, happy, dancing wedding. When the invitation came for the audience to dance, hundreds jumped up, held hands, and danced through the aisles. As Mr. Netsky mentioned, tunes also took them back to the synagogue. Their version of Shalom Aleichem was lovely and touching. That song welcomes the Sabbath “Peace be upon you, blessed peace of Sabbath eve,” and the “ministering angels of most high.” Itzhak Perlman is not only the great violinist, he is the great human carrying his message of peace and joy through his music as he travels the world like Klezmers of all time. Featured, astonishing musicians: Hankus Netsky, music director, saxophone, piano, arrangements; Michael Alpert, vocals, guitar, accordion, violin; Judy Bressler, vocals, tambourine; Lorin Sklamberg, vocals, accordion; Frank London, trumpet; Andy Statman, clarinet, mandolin; Mark Berney, trumpet; James Guttmann, bass; Mark Hamilton, trombone; Pete Rushefsky, bass clarinet, tsimbl; Grantley Smith, drums; Ilene Stahl, clarinet. This entry was posted in Hedgehog Highlights and tagged Andy Statman, Brave Old World, Eternal Echoes, Frank London, Grantley Smith, Hankus Netsky, Ilene Stahl, In the Fiddler's House, Itzhak Perlman, James Guttmann, Judy Bressler, Klezmatics, Klezmer, Klezmer Conservatory Band, Lorin Slamber, Mark Berney, Mark Hamilton, Michael Alpert, Pete Rushefsky on January 17, 2019 by Leslie. IDF@SV 2019: Register & Buy Tickets NOW!